When I posted “autumn at Schenectady’s Riverside Park” and “October in the Schenectady Stockade” last February, I announced that the conference Haiku North America 2015 would be coming to Schenectady’s Union College, from October 14 – 18, and would attract many of the best-known English-language haiku poets and publishers from around the world. My hope then was to use the autumnal beauty of Riverside Park and the Stockade Historic District to help lure those hypothetical poets to my City. At the time, the Conference seemed to be far in the future, and our prospects were hopeful but uncertain. Well, as I write today, HNA 2015 is less than two weeks away, and our local organizing committee is pleased to see that the turnout will be robust, maybe even historically large. 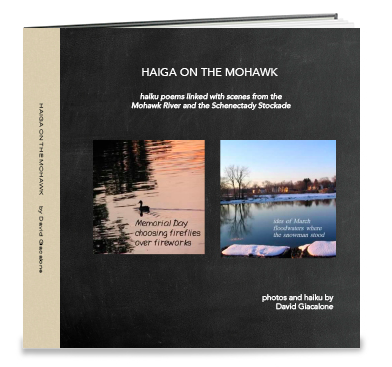 To celebrate the coming of Haiku North America 2015 to Schenectady, I have put together the photobook “Haiga on the Mohawk” (cover shown on the right), which has several dozen photos taken in the Stockade neighborhood and along our stretch of the Mohawk River. Each photo incorporates a haiku poem that is linked to the image by subject or spirit (or whimsy). Photo haiga are a modern form of an ancient Japanese artistic genre that included a painted image (using ink-brush) and calligraphy of a haiku or similar short, “linked” poem. If you go to our Mohawk Haiga page, you will find a link to the Shutterfly.com website, where you can view Haiga on the Mohawk in its entirety at no charge. In addition, you will find each of the 37 haiga featured in Haiga on the Mohawk, and can click for a larger version. I’ve also included two photos that let you Make Your Own Haiga. Accompanying HNA 2015, there is an exhibit of traditional haiga by Romanian artist and poet Ion Codrescu, at Union College’s Nott Memorial, in its Mandeville Gallery. The Codrescu Haiga Exhibit runs through the end of November. 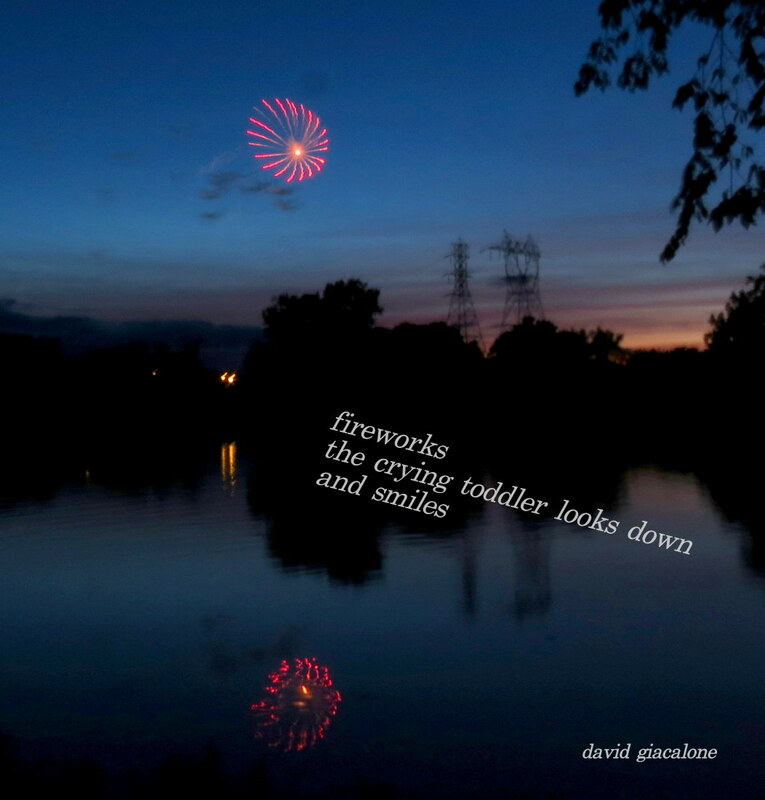 Here’s one of my favorite photo-haiga from Haiga on the Mohawk. The photo shows the Jumpin’ Jack’s fireworks display, shot from the end of Cucumber Alley along the bank of the Mohawk River. I hope you will enjoy the 36 other haiga at Mohawk Haiga page, and I know you will enjoy Ion’s exhibit at the wondrous Nott Memorial (see my preview of it here).